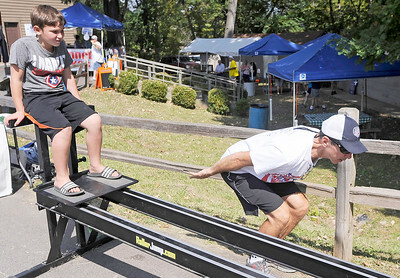 Gregory Shaver for Shaw Media Garrett Sparks, 8, of Elgin, gets some tips from Guy Larson as he tries his hand a ski jumping during the 32st annual Norge Autumn Ski Jump competition Saturday afternoon, Sept. 16, 20176, at the Norge Ski Club, 100 Ski Hill Road in Fox River Grove. The event which also takes place on Sunday features some of the best ski jumpers from the country and around the world, according to the release. Norge Ski Club has been holding competitions since it opened in 1905. 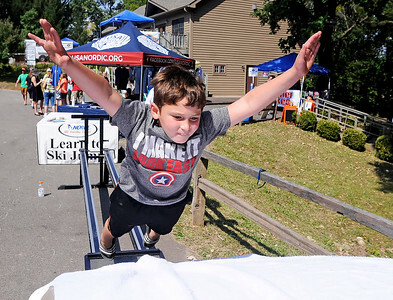 Gregory Shaver for Shaw Media Garrett Sparks, 8, of Elgin, tries his hand a ski jumping during the 32st annual Norge Autumn Ski Jump competition Saturday afternoon, Sept. 16, 20176, at the Norge Ski Club, 100 Ski Hill Road in Fox River Grove. The event which also takes place on Sunday features some of the best ski jumpers from the country and around the world, according to the release. Norge Ski Club has been holding competitions since it opened in 1905. 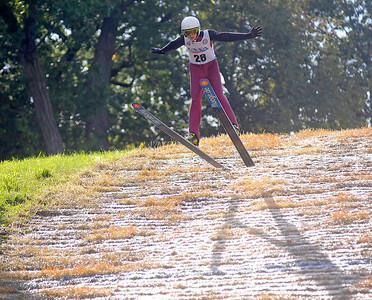 Gregory Shaver for Shaw Media Estella Hassrick ski jumps off the 40-meter hill during the 32st annual Norge Autumn Ski Jump competition Saturday afternoon, Sept. 16, 20176, at the Norge Ski Club, 100 Ski Hill Road in Fox River Grove. The event which also takes place on Sunday features some of the best ski jumpers from the country and around the world, according to the release. Norge Ski Club has been holding competitions since it opened in 1905. 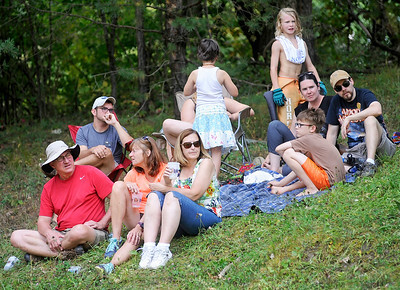 Gregory Shaver for Shaw Media People watch the jumper during the 32st annual Norge Autumn Ski Jump competition Saturday afternoon, Sept. 16, 20176, at the Norge Ski Club, 100 Ski Hill Road in Fox River Grove. The event which also takes place on Sunday features some of the best ski jumpers from the country and around the world, according to the release. Norge Ski Club has been holding competitions since it opened in 1905. Gregory Shaver for Shaw Media Stewrt Gundry ski jumps off the 40-meter hill during the 32st annual Norge Autumn Ski Jump competition Saturday afternoon, Sept. 16, 20176, at the Norge Ski Club, 100 Ski Hill Road in Fox River Grove. The event which also takes place on Sunday features some of the best ski jumpers from the country and around the world, according to the release. Norge Ski Club has been holding competitions since it opened in 1905. 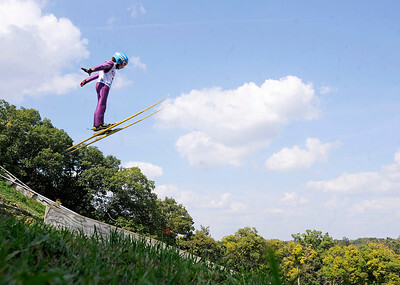 Gregory Shaver for Shaw Media Sandra Sproch ski jumps off the 40-meter hill during the 32st annual Norge Autumn Ski Jump competition Saturday afternoon, Sept. 16, 20176, at the Norge Ski Club, 100 Ski Hill Road in Fox River Grove. The event which also takes place on Sunday features some of the best ski jumpers from the country and around the world, according to the release. Norge Ski Club has been holding competitions since it opened in 1905. 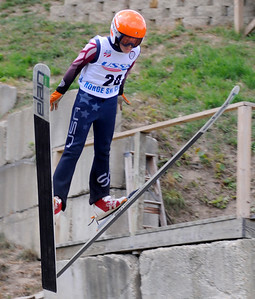 Gregory Shaver for Shaw Media Caleb Zuckerman ski jumps off the 40-meter hill during the 32st annual Norge Autumn Ski Jump competition Saturday afternoon, Sept. 16, 20176, at the Norge Ski Club, 100 Ski Hill Road in Fox River Grove. The event which also takes place on Sunday features some of the best ski jumpers from the country and around the world, according to the release. Norge Ski Club has been holding competitions since it opened in 1905. Gregory Shaver for Shaw Media Cameron Summerton hives Gavin Rickerson a fist bump after finishing their jumps during the 32st annual Norge Autumn Ski Jump competition Saturday afternoon, Sept. 16, 20176, at the Norge Ski Club, 100 Ski Hill Road in Fox River Grove. The event which also takes place on Sunday features some of the best ski jumpers from the country and around the world, according to the release. Norge Ski Club has been holding competitions since it opened in 1905.